A gorgeous colour and a delicious taste make this a very attractive pudding for babies and young children. 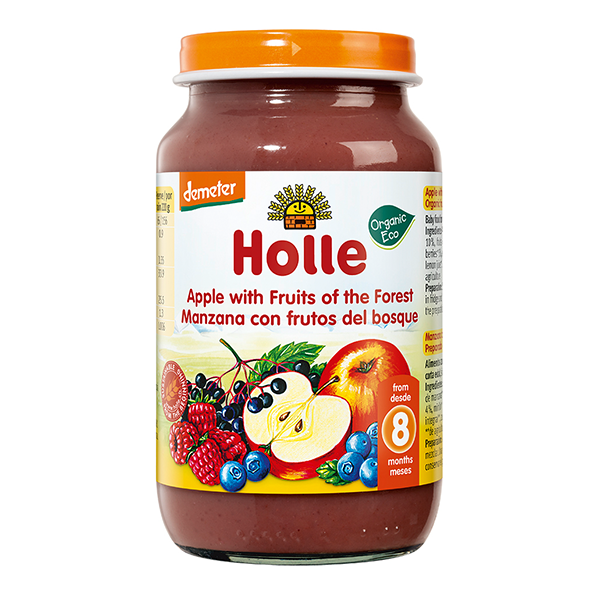 Combining apple with three favourite forest fruits gives a dessert that babies keep coming back to - and you know it's full of fruit goodness. In a bigger jar for baby's growing appetite. Still in a pureed texture to mix with a coarser porridge or for babies whose teeth haven't come through yet (or still only have a few). Part of a mixed diet from 8 months of age. Free from dairy products. No added sugar. Contains gluten. No cooking required. Suitable for vegetarians and vegans. Once open store in fridge and use within 2 days. To increase the availability of essential fatty acids we recommend fortifying with 1 teaspoon weaning oil. When introducing solid foods begin with a few spoons and increase the amount slowly according to your baby's needs. Apple**(48%), water, apple juice concentrate*(10%), forest fruits (7%) (raspberry* 4%, bilberry* 3%, elderberry* 0.1%), wholegrain rice flour**, lemon juice*. Water is added for cooking and to ensure the appropriate texture. My baby simply loves it.